"This is a quick and easy recipe. 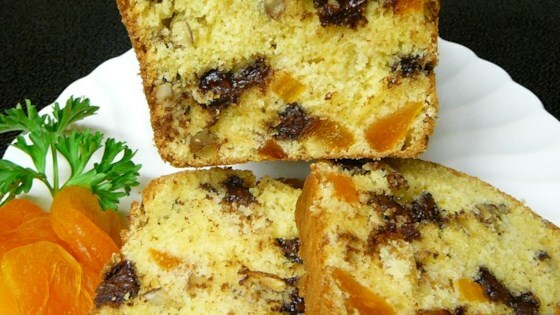 It makes a delicious loaf that is both sweet and tart and has just a touch of chocolate." Preheat oven to 350 degrees F (175 degrees C). Grease a 9x5 inch loaf pan. Sift together flour, baking powder, salt and baking soda, set aside. In a large bowl, cream together the butter or margarine and sugar until light and fluffy. Add the orange juice, milk and egg; beat well. Gradually blend in the flour mixture. Stir in the apricots, chocolate chips and walnuts. Pour batter into the prepared pan. Bake at 350 degrees F (175 degrees C) for 50 to 55 minutes, or until a toothpick inserted into the center of the loaf comes out clean. Cool loaf in the pan for 10 minutes before removing to a wire rack to cool completely. Very thick batter, bread is a little dry, but has good flavor. That bread is very delicious! This bread tastes wonderful, but it's quite crumbly. Just slicing it is a challenge. If I make it again I would reduce the amount of apricots. Delicious! BUT..... DOUBLE the OJ SKIP the Milk, Nuts, and Chocolate Chips ADD 1 Tbs. Grated Orange Peel Brilliant recipe otherwise. THANKS!! very dry recipe, needs more butter or something, flavor is good though. I would try increasing the fat to 1/2 to 3/4 c.